Wild-caught salmon is easily one of my FAVORITE foods, like I could eat it almost daily. 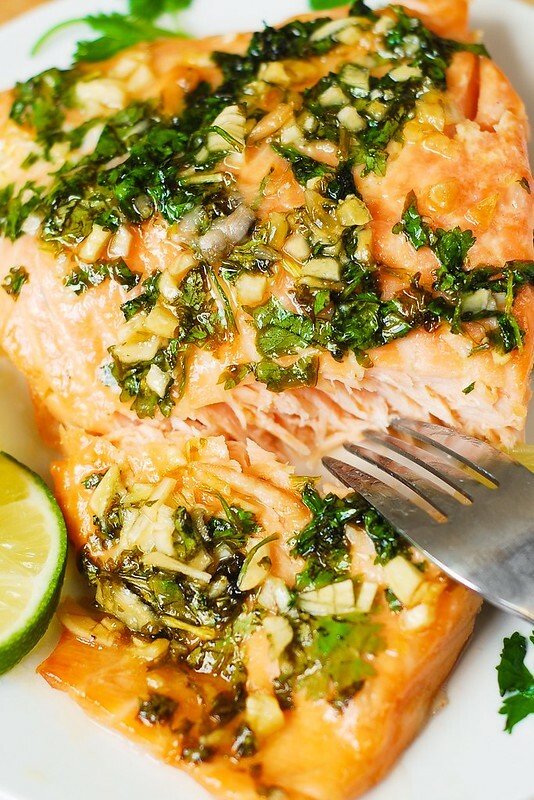 Add garlic, cilantro, lime, and honey to the mix and it’s hard to go wrong! Not a fan of salmon? Try this recipe – the right marinade can really make a big difference. Sharing is caring friends, so I’m sharing this recipe adapted from Julia’s Album that I have been using for a couple years now and am in love with! Divide salmon into desired portions. Rinse and pat dry salmon. Brush with 1 tablespoon of olive oil on all sides. Season with salt and pepper. Place the salmon on a large piece of foil. Fold foil sides and ends up (1 or 2 inches high) tightly around the salmon. Place the salmon in foil on a baking sheet. In a small bowl, combine honey, lime juice, and garlic. Mix to combine. Spread this mixture over the salmon. Sprinkle chopped cilantro on top. Do not cover salmon with foil, leave it open (with foil sides up) and bake it just like that, at 400 F for 20-25 minutes. Carefully remove salmon from foil, separating the salmon from the skin which will remain stuck to the foil. Place the salmon onto a serving plate. Carefully scoop the sauce from around the salmon and pour over the salmon. It’s super simple, nutritious, and delicious. What’s not to love? Give it a try and let me know how you like it!